THE HAGUE, March 7. /TASS/. The jurisdiction of the UN International Court does not apply to a lawsuit filed by Ukraine against Russia, Russian Foreign Ministry Legal Department Director Roman Kolodkin said during a court hearing on Tuesday. According to him, by filing a lawsuit against Russia’s alleged breach of the Convention for the Suppression of Terrorism Financing and the Convention on the Elimination of All Forms of Racial Discrimination, Ukraine pursues two goals. "The first goal is to draw the panel into the discussion of the issues that should be tackled by Russia and Ukraine and are clearly outside the court’s competence, such as sovereignty, territorial integrity and the right to self-determination," he said. "And the second goal is to use the court’s podium to accuse a considerable part of the country’s population, which has centered itself around the DPR [Donetsk People’s Republic] and LPR [Lugansk People’s Republic], of terrorism, and Russia of terrorism sponsoring," he added. 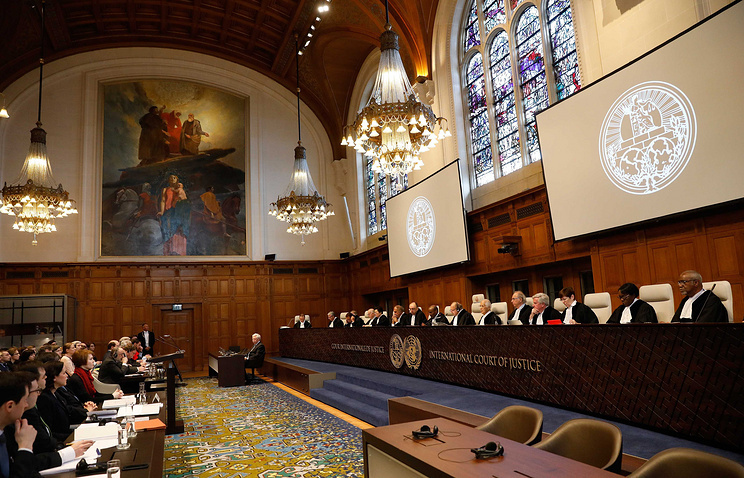 The UN International Court in The Hague launched hearings on March 6 into Ukraine’s lawsuit against Russia. The Ukrainian side claims in its lawsuit that since 2014 Russia has intensified its interference in the Ukrainian affairs "by way of a military intrusion into Ukraine" and "the financing of terrorist acts," and also seized "a part of the Ukrainian sovereign territory" in Crimea "by the military force." As the Ukrainian authorities assert, Russia "is carrying out a purposeful campaign for cultural cleansing" on these territories, thus violating the International Convention on the Elimination of All Forms of Racial Discrimination. In view of this, Ukraine demands that Russia be recognized as a party guilty of "terrorism sponsoring" and be obliged to stop all forms of its support for the self-proclaimed Donetsk and Lugansk People’s Republics. The Ukrainian authorities also demand that Russia fully compensate for damage for the alleged downing of a Malaysian Boeing airliner over the Donbass region in 2014 and the alleged shelling of civilians in Donbass cities. Russia’s Foreign Ministry said earlier that Russia "has always resolutely denounced any manifestations of terrorism and is actively fighting it." In the opinion of the Russian Foreign Ministry, "Ukraine has not provided substantiations for its position that there are circumstances falling under the convention." According to the Russian Foreign Ministry, as Russia was trying to study the substance of Ukraine’s claims, it was confronted "with the strong unwillingness of the Ukrainian departments to hold a substantive dialogue and, in the final account, with the unilateral disruption of the consultations by the Ukrainian side." In view of this, Russia’s Foreign Ministry has made a conclusion that "Ukraine’s basic, if not sole, aim from the very outset was to look for a cause for applying to the International Court against the Russian Federation rather than to settle any disagreements." Kiev is not interested in the real protection of people or the observance of treaties and only pursues situational political interests, the Russian Foreign Ministry believes.